Oregon's Democratic Gov. 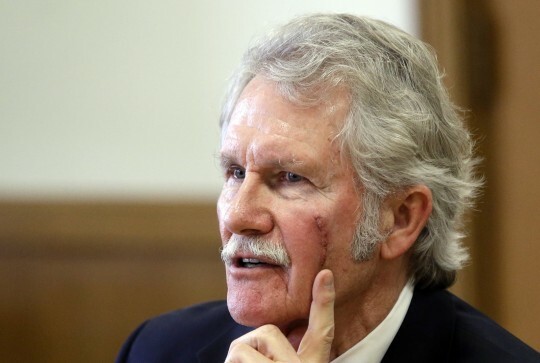 John Kitzhaber will resign this afternoon, multiple sources told Portland's KOIN. News of the governor's resignation comes after the governor was accused of using his influence to arrange contracts for his fiance's green energy company and ordering the deletion of thousands of emails relevant to the scandal. In recent days the governor had faced mounting calls for his resignation, including from members of his own party. Oregon Senate President Peter Courtney and House Speaker Tina Kotek both called for the governor to step down. Many other public officials made the same plea. "It is with deep sadness that I ask Gov. John Kitzhaber to resign his position as governor of Oregon," State Treasurer Ted Wheeler told KOIN yesterday. "Unfortunately, the current situation has become untenable, and I cannot imagine any scenario by which things improve." "Oregon deserves a governor who is fully focused on the duties of state." These calls have had an impact on Kitzhaber's decision making, according to the KOIN report. The governor has yet make a public announcement of his resignation. This entry was posted in Politics and tagged Democratic Party, Green Energy, Oregon. Bookmark the permalink.